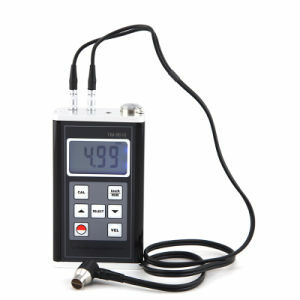 Handheld Ultrasonic Thickness Gauge with metal case and test range from 0.9~400mm. Used for measuring thickness and corrosion of pressure vessels, chemical equipment, boilers, oil storage tanks, and more in industries of petroleum, ship building, power station and machine manufacturing. It uses the latest high performance and low power consumption microprocessor technology. Applicable to measure the thickness of many materials, e.g. Steel, Cast iron, Aluminum, Red copper, Brass, Zinc, Quartz glass, Polyethylene, PVC, Gray cast iron, Nodular cast iron.